p1 “HMS Cairo” Cruiser in full colour by Don Wilson. p2 Meet the Editor, Bruce Neilson. p3 Photos of The Beatles, Lamp shade, Pile driver, Bendy boat. p4 Behind the scenes at the 2001 Convention by Bryan Jones. p6 David Feinstein, Graham Jost, Jack Parsisson, Hans van Ouwerkerk, Bruce Douglas, Dave Barrett. p8 Cranes - Chipper loading, Blocksetting, Coal, Salvage, Lorry, Level luffing, Mobile. p10 Group photograph at Convention 2001.
p12 “Samantha” the 1929 Steam Tractor by Bob Prescott. p14 Spanner Report for June 2001 by William Irwin. p15 Bits and Pieces by Lloyd Spackman. p16 The Pick of the Overseas magazine articles by Bruce Neilson. p17 Convention 2003 - $200 and $800 Competitions. p18 Meet Frank Price by the Auckland Meccano Club. p18 Differential Analyser Myths by William Irwin. p19 The NZFMM Magazine is 25 years old by Bruce Neilson. p19 The Wisdom of Keith Cameron by Lloyd Spackman. p19 Convention 2003 will be held 18-19-20 April 2003 at Community Centre, Hawera, Taranaki, NZ. p20 Auckland Meccano Club Meeting May 2001 with group photo by Peter Hancock. p21 Wellington Club Meeting April 2001 by Bryan Jones. 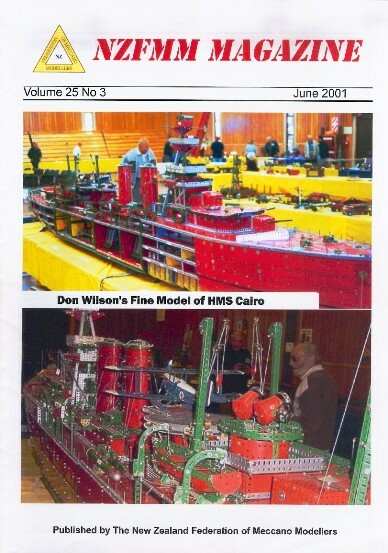 p22 MWT Meccano Club Meeting June 2001 with Tug of War photos. p23 Christchurch Meccano Club Meetings April 2001 and June 2001 by Graeme O’Neill and Ian Torrens. p24 New Zealand Club Diary 2001, Contacts, and Buy, Sell, Exchange.